Ontworpen om te voldoen aan de behoefte voor een wide range van algemeen gebruik zoals voltage, sensor en transducer logging applicaties: De "PicoLog 1000 meerdere kanalen data acquisitie series" met onafhankelijke software en configureerbare verschaling en control outputs maar ook een extern terminal board voor custom front–end circuitry en de keuze voor een 10– of 12–bit input resolution. The budget model PicoLog 1012 has 12 input channels. The powerful PicoLog 1216 has 16. Need more channels? No problem. Using PicoLog you can connect up to 4 Pico data loggers to one PC — giving you a potential 64 channel PicoLog 1000 series data acquisition system, or the ability to use your PicoLog 1000 logger with other devices such as the USB TC-08 Thermocouple Data Logger. With 10– or 12–bit resolution and multiple sampling modes, a PicoLog 1000 series logger will meet your data logging needs. 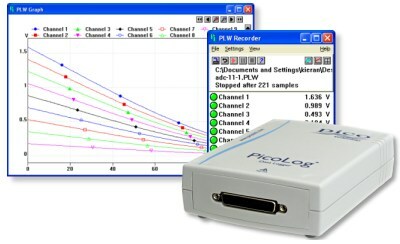 The PicoLog 1000 series has 3 sampling modes: Streaming mode allows channel voltage readings to be logged continuously at up to 100 kS/s, while block mode captures up to the full 1 MS/s sample rate of the logger for a duration limited by the 8000 sample buffer, both these speeds applying to single–channel operation. The PicoLog application provides an extra mode, real–time continuous sampling, which provides averaged, time–accurate readings with automatic measurements at up to 1 kS/s on any number of channels. The PicoScope 1000 series data loggers include digital outputs — including one with pulse–width modulation control (PicoLog 1216 only). These outputs can be used to control alarms or other devices, additionally these can also be used to power sensors such as thermistors. Your PicoLog 1000 series multi–channel data acquisition (DAQ) device includes all you need to start measuring and recording. 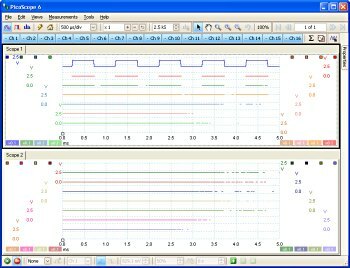 A full suite of software is included in the price and consists of PicoLog data logging package, the PicoScope oscilloscope package — which provides measurement capabilities while allowing you to view all 16 channels at once — and an SDK for using the PicoLog 1000 within your own software, or third party software such as LabVIEW. 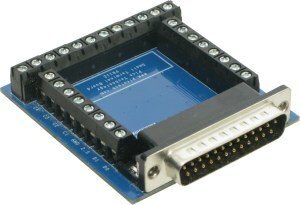 Additionally, an optional terminal board with screw terminals lets you easily and quickly connect your sensors to the logger. The board also has solder pads on which you can fit resistors to widen the measuring range for each input. With great performance and versatility, up to 16 inputs and 4 outputs per unit, a low per–channel cost and easy to use features, the PicoLog 1000 series is the multi–channel data acquisition device that you need.